With Veronica jettisoned to boarding school by her father, 'Archie' is left with a vacuum of villainy.Veronica was more of a rival anyway but with the arrival of Cheryl Blossom as her new classmate, there's no question who the ultimate mean girl is. Mark Waid has done some of his best work as the writer of the series and not only contemporizing the Riverdale gang but really fleshing them out as more multi-dimensional characters than we're used to. In comes Cheryl, who as the evil queen of Veronica's new school, is determined to stay on top. Waid is indulging in some mean-spirited double-crossing in portraying 'Archie's real villain with all the delight of a soap opera. It's not long before Cheryl has her sights on Veronica's weak spot - Archie. Things are about to get more twisted. There are very few comic books that have been as consistently great as 'Archie.' Waid and every group of artists have given this classic series a remarkably fun and relatable update that honors its past. 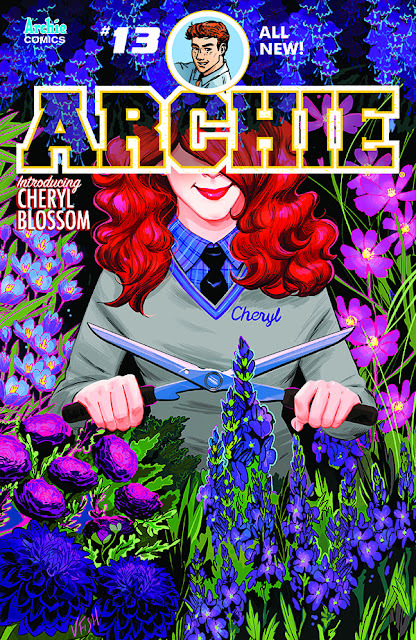 Now with the introduction of the conniving Cheryl Blossom, 'Archie' is about to take on a more devilish fun turn. It's can't miss entertainment.